First and foremost: What’s your favorite flower? It all depends on the season! In the winter, I truly love the fritillary, the checkered lily. I also love poppies, but I really do like unusual flowers. I tend to shy away from hydrangeas and roses and the like. There are so many flowers out there with unusual shapes, they're so much more interesting! Tell us more about yourself: what brought you into the world of floral design? I grew up in Belgium, and flowers are part of everyday life over there. We always had flowers at home. When I moved to this country 40 years ago, I was a teacher by trade, but I knew I didn’t want to keep teaching high school kids. I really wanted to work with flowers, but when I moved here, the flower scene was extremely different than in Belgium. The selection was incredibly poor, so I got into gardening and put the business idea on the back burner. I learned all I could about flower varieties, and in ’96, I made a big step started a flower business in the basement. In the beginning, I focused on weddings and events, and slowly but surely began to teach evening classes. In ’09, I began to teach wedding workshops after I outgrew the basement and opened a studio on backyard. Later, I was encouraged to take workshops on the road, so I stopped marketing weddings and began to focus on teaching. This took on a life of its own, and now it’s my bread and butter. What are your major achievements/meaningful moments in your business thus far? Any challenges? I knew I wanted to work solo and didn’t want to manage employees, so that really limits number of weddings a person can do. What I have liked most about my floral career is that I’ve been able share lots of information with others through teaching. There was no such thing as people being so interested in learning and sharing information when I started my business in ’96! A challenge was definitely that I knew nothing about the business side — the marketing, pricing. . . I had to figure it all out on my own. Since then, it’s been a real pleasure and joy to be able to share that part of the business with so many people in different places along with the fun decorating. 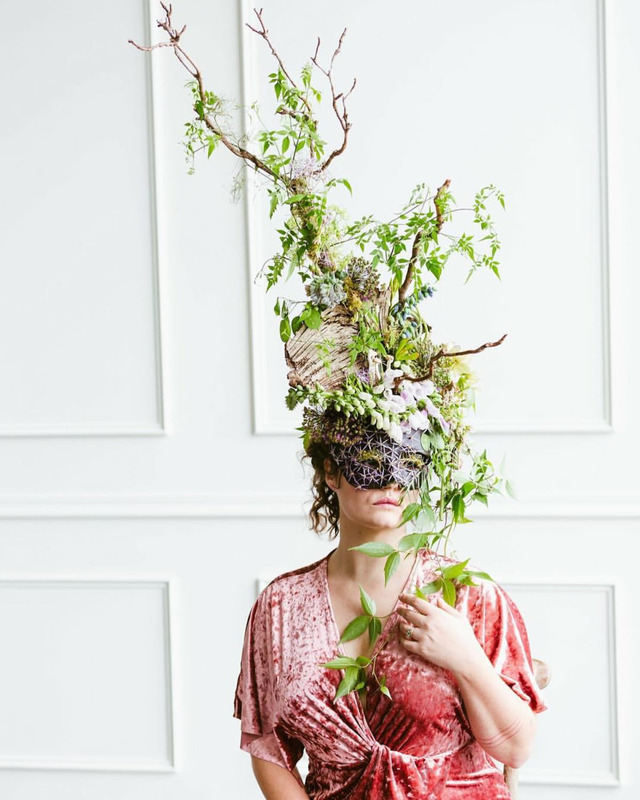 Wearable botanicals from Francoise's recent shoot. It’s such hard work! The flower industry must be one of the most romanticized on this Earth. There’s so much else that needs to be taken care of, designing is such a small part of what we do. It’s very hard work, and a lot of people don’t realize that, but I wouldn’t trade it for anything. What is your favorite thing about working in the floral industry? I have met so many people that have come along with teaching. When I worked by myself in the studio, I didn’t connect with many others. Along with teaching, social media changed that to a huge degree as I was invited to teach in the U.S. and abroad. I have met hundreds and hundreds of people sharing the same passion of flowers, and it just makes my heart sing. Be prepared to work very hard. If I had to do it over, I would have taken business classes to be better informed on all aspects of the industry. It’s also very good to be curious, inform yourself, read books, and take workshops to expand your horizons on what you can do.